Knot tying represents the final hurdle for proficiency in intracorporeal suturing. Were suturing and needle driving not difficult in themselves, one might say that extracorporeal knotting would certainly be the method of choice. But because the skills necessary for complex endosurgical reconstruction are all linked, knotting represents the last, most difficult task (149). In addition, once mastered, intracorporeal knots can be manipulated to the endo-scopic surgeon's advantage for complex anastomoses, very much like in microsurgery (more on this later) (150). The key to successfully mastering intracorporeal knotting has been careful, small, orchestrated movements of the instruments in both of the surgeon's hands. FIGURE 23 ■ The 12 steps in choreographing the right and left hands for accomplishing fluid intracorporeal suturing and knotting. The intracorporeal knot having the most utility is the simple square knot. A square knot is two apposed half hitches, one atop the other. To orchestrate the movements necessary to tie such a knot and eliminate wasted motion, each key movement must be identified and the entire sequence practiced. We have previously discussed the 12 steps in tying an intracorporeal square knot (Fig. 23) (151). Step 1 is the starting position. A "C" shape is made in the suture with the right hand grasping the swaged end of the suture and the left stabilizing the tail. Step 2, the right hand only moves to create a loop around the tip of the left instrument. Step 3, the right and left hands move together as the left instrument grasps the tail of the suture. Step 4, the instruments are pulled in opposite directions paralleling the pull with the suture. Step 5, the knot is adjusted to center the first half hitch directly above the laceration by placing more tension on the right or left hand grasp of suture. Step 6, sets up throwing the second half hitch. The right grasps the swaged end and is rotated 180° clockwise. Step 7, the left instrument releases the short tail and grasps the swaged end near the right grasper. Step 8, the right instrument releases the suture and is placed on top, directly in front of the left grasper. Step 9, the left hand moves to create a loop around the right, which remains stationary. Step 10, the right and left instruments move together toward the short tail, which the right then grasps. Step 11, both instruments are pulled in opposite directions parallel to the stitch. Step 12, the two opposing half hitches are tightened against each other. This concludes the exercises necessary to orchestrate fluid interaction and minimize wasted motions, thus limiting the surgical frustration. Methods other than that described above can be utilized for laparoscopic intracorporeal knotting: by prefacing these techniques with the reminder that intracorporeal suturing is difficult, but with time, patience, and practice it can be mastered. Utilizing microsurgical principles adapted for the laparoscopic environment, knots and sutures can be manipulated to the surgeon's advantage. This should be kept in mind when considering intracorporeal suturing techniques and taking short cuts (152). FIGURE25 ■ Pietrafitta's technique of stabilizing each half-hitch. FIGURE24 ■ Pin-vise suturing technique. FIGURE27 ■ Fly-casting method for intracorporeal knotting. FIGURE26 ■ Smiley face technique of intracorporeal knotting. Depending upon the intracorporeal instruments utilized, a variety of intracor-poreal knotting strategies can be performed. If a pin-vise needle driver is chosen, an intracorporeal "twist" technique can be performed (Fig. 24). Utilized by H.C. Topelb and L. Sharpec, a sequence of twists (usually 2-3 cm) on the needle wrap the suture around the assistant grasper, keeping the needle curve parallel to the introducer. The free grasper helps release the needle and swage from the jaws, carefully maintaining the loops. Then the looped grasper can grasp the tail and the instruments move in opposite directions to tighten the half hitch. This "twisting" technique can be utilized for both curved and straight needles. Straight needles can be utilized with conventional laparoscopic instruments. Here, the needle is used to wrap the swaged end about the assistant grasper, as long as the instrument is oriented toward the assistant. The tail can then be grasped from the now "looped" grasper. Another technique reported to simplify intracorporeal knotting describes grasping both ends, forming a loop above the repair (153). The needle driver can then loop through either side to facilitate formation of each half hitch (Fig. 25). This technique hopes to eliminate "complicated, dextrous, simultaneous two-handed motions." The "smiley face" technique is another method of promoting the intracorporeal formation of knots (Fig. 26). During intracorporeal suturing with this technique, emphasis is placed on manipulating both swage and tail segments with the needle. The needle is grasped midshaft with each end pointing upward, forming a "smiley face." Each half hitch is then facilitated by wrapping the needle around the assisting instrument to form loops. This technique results in fixed orientation and a stable continuing starting place. Kozminski and Richards have recently described a fly-casting technique to aid intracorporeal knotting with interrupted sutures (154). The tail is grasped and held up in space, and next the swage is passed over the tail and allowed to drop by gravity. The swage is retrieved from the underside for the first half hitch (Fig. 27). Mirror-image repeat of this sequence results in a square knot. Finally, a prelooped needle and suture is available for intracorporeal stitch-ingd. Once introduced to the area of reconstruction, the needle is advanced and grasped by the driver. The needle is then passed through the preformed double loops and pulled in opposite directions. The applicator plunger is next pushed, pulling the tail and tightening the slipknot. A surgeon's knot can be incorporated by placing two loops around the left grasper during the first half hitch. A surgeon's knot adds to the security against slipping, especially with monofilament sutures such as polypropylene. If further modifications of the knot are required, then the surgeon's knot should not be deployed. FIGURE29 ■ Rollero's method of starting a running suture line. FIGURE28 ■ Jamming loop knot (Dundee) shown previously can be used for extracorporeal knotting or starting a running stitch. FIGURE 30 ■ The Aberdeen knot (crochet) can be used to securely synch a running intracorporeal suture line if concern exists about crimping a monofilament suture. be manipulated with the free swaged end. This double-stranded loop can result in increased demands upon the needle driver and assistant instrument to maintain tension on the suture line while performing intracorporeal knotting. Some monofilament sutures can fracture due to pressures applied by the instruments during knotting. Because of these problems, alternatives have been sought for running intracorporeal knotting. The jamming loop knot (Dundee jamming loop knot) can be thrown extra- or intracorporeally (Fig. 28). The running suture line can be initiated with the knot outside of the abdomen. The suture is then grasped along the swage and passed intra-corporeally, usually with the aid of a reducing sleeve. The needle is then passed through the tissues and pulled until the loop approximates the tissues. The needle is then passed back through the loop, and the swage and tail ends are pulled in opposite directions jamming the knot (15,45). J.W. Rollero describes the use of a noose-like knot to start running intracorporeal suture lines (Fig. 29). The first two loops are made in a counter-clockwise fashion. The tail crosses over the loop and is passed through the center. A third loop is formed by passing back through the center. The first running stitch is passed back through this third noose, anchoring it into place as the tension is applied. The Aberdeen (crochet) knot allows the intracorporeal completion of the running suture line (Fig. 30). Its major advantage over simple square knots is the avoidance of unequal lengths being manipulated intracorporeally and excessive force being applied to monofilament suture materials. Here the suture is first passed beneath the last running stitch before it is tightened to form a loop. Asecond loop through the first is fashioned, and then the swage with needle is passed through, tightening both the loop and synching the knot (155). 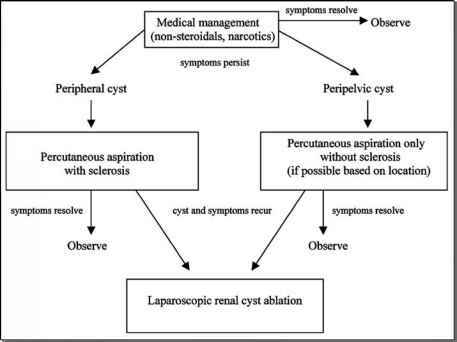 Recently, the interest in running sutured anastomosis has prompted resurgent interest in this technique, particularly, as it applies to the vesicourethral repair following laparoscopic radical prostatectomy. 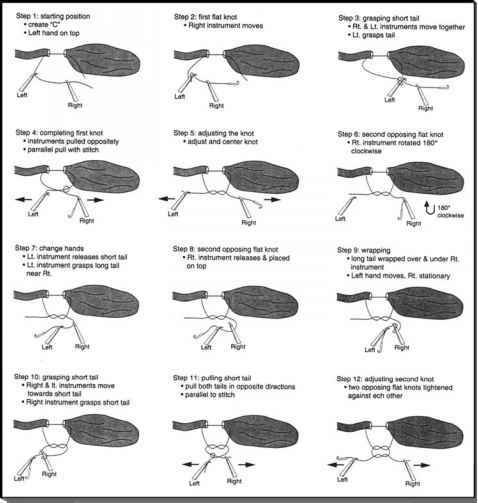 This running technique has attracted some significant research attention lately and will addressed separately in the section entitled Running Suturing.